Polyester film with a satin textured surface providing for optimum ink adhesion and scratch resistance. 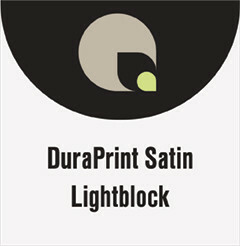 Compatible with solvent, UV curable and latex inkjet inks. The base film is a satin textured white top layer fused in manufacturing to a grayback block-out layer that will not split, curl, buckle, or warp providing for a dimensionally stable final product. The block-out layer hides the display hardware and eliminates light transmission that can weaken image density.